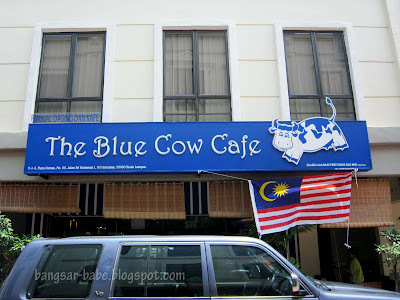 I met the owner of Blue Cow Cafe when rif and I were at Cold Storage BSC, looking for meat patties for his pork burger. He explained to us about the types of patties he had and told us to drop by his shop at Plaza Damas — they have more variety and the patties are cheaper. Long story short, we went there, bought the patties, made the burgers and enjoyed them. I told rif I wanted to try their burgers one day, and we did, yesterday. At the centre of the cafe, are display counters with a variety of beef cuts, pork cuts, ribs, patties, sausages and hams. 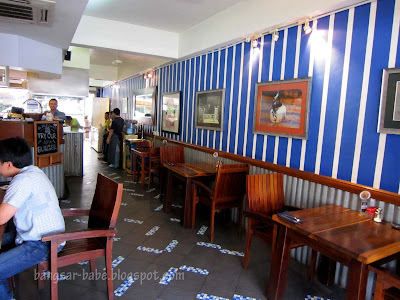 We sat outside, glanced through the menu and ordered what we came here for – burger. 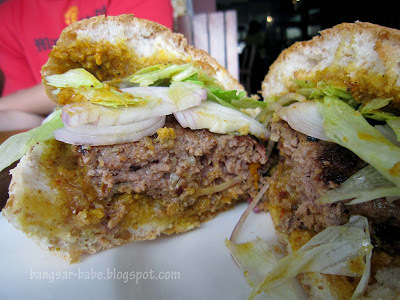 I had the Cuban Burger (RM26), while rif made a daring choice – Rendang Burger (RM22). When it comes to food, he likes taking risks, and is often pleasantly surprised. Whenever I attempt what he does, I’m often ‘rewarded’ with a plate of mediocrity. 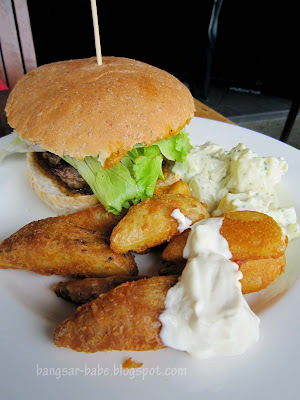 My burger looked unassuming, and my choice of sides (chip and potato salad) didn’t quite add colour to my plate. But the burger packed a punch. 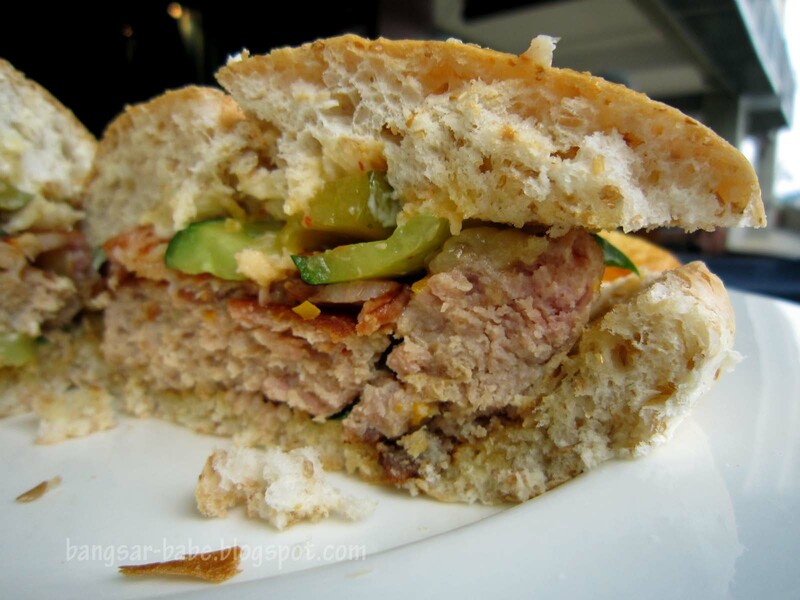 The pork patty was juicy, oh-my-gawd porky, and dressed with a slice of cheese, ham, pickles and Dijon mustard. I liked the wholegrain burger bun, which provided a better hold and had a nicer texture. 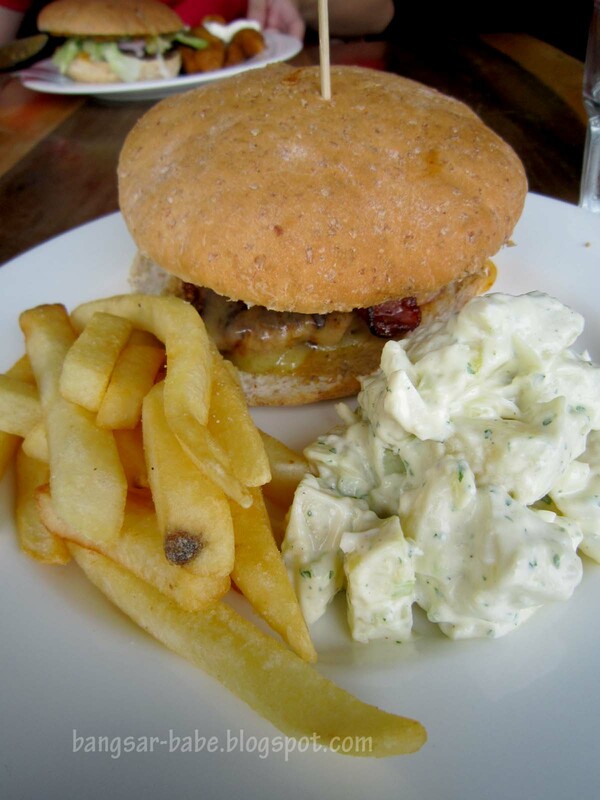 The Dijon mustard enhanced the flavour of the patty and balanced out the saltiness of the pickle, ham and cheese. Potato salad was creamy and fragrant from the herbs, but the chips could have been crispier. rif’s rendang burger was also quite good. The beef patty was thick, juicy and lightly charred on both sides. Generously slathered with rendang sauce and topped with onions and lettuce, the burger was a delicious combination of local and western flavours. 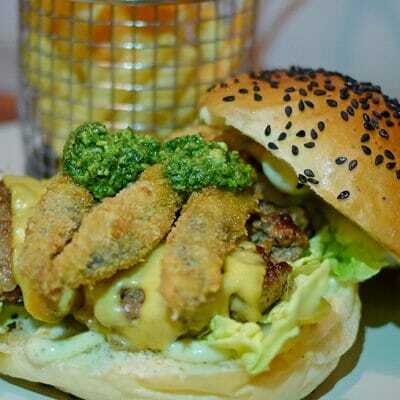 I tend to be sceptical about fusion dishes, but this burger was fusion done right. The wedges were nice and crispy, a lot better than the chips. I’m definitely ordering these on my next visit! 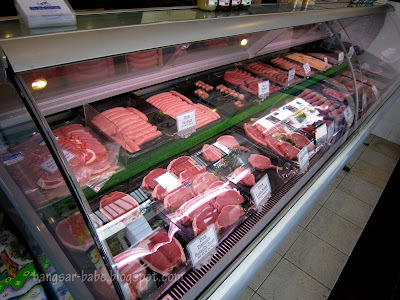 Verdict: I liked the burgers, and am planning to go back for the grilled meats and sausages. Yeah! Another place that I can go for pork burger. A bit pricey though if compared with Sid's Pub. This is near my place.. and the food so yummie.. is it your photo skils or really nice? both the pork/beef patty are chunky and meaty. J – Ooooo….sounds delish. I should try that next time! TikkoSS's Blog – I think the lighting was just right on that day. But thanks for the compliment! leo – Go to Plaza Damas…exit at the Starbucks exit, turn left, go up the escalator and the cafe is on the left. Simon – Around the same price. Their normal burger is about RM19. My burger got ham, cheese and pickles…that's y a bit pricey. another burger place.. nice.. gonna have to try it one day..
Sean – Hahaha…they do! I spotted a few people having cocktails with their big breakfasts.